Do I post too many Mexican dishes? I know that pretty much all Mexican food uses the same list of ingredients, just put together in different ways. So some of these Mexican recipes may seem a bit redundant. However, the hubs and I LOVE Mexican, so any version of the same ol’ stuff is good to us. The not-so-secret ingredient in this dish is the salsa con queso. It provides a unique and creamy flavor/texture that we loved! This tasted great, but the pictures don’t really show it off well. Maybe I should’ve let it cool a few more minutes before taking it out of the pan. Or, even better, if I’d had a springform pan, then you’d really see how cool this could look! 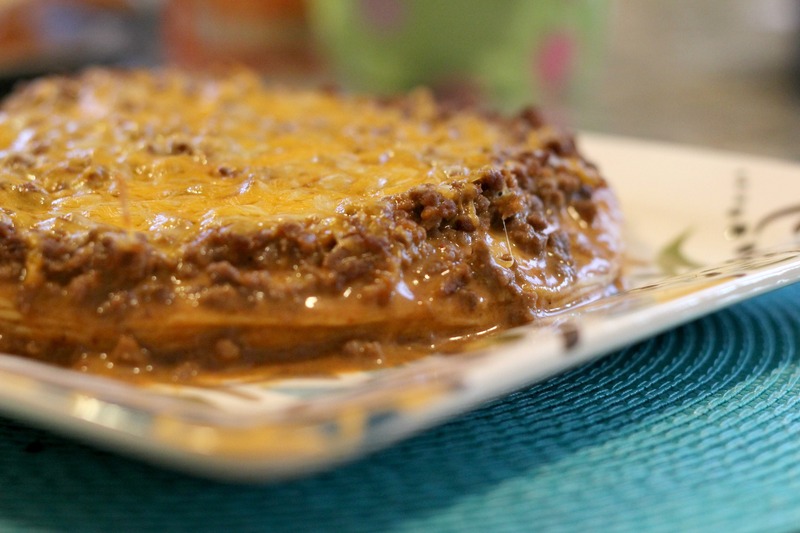 It’s sort of like a taco pie, with built in layers. In the pictures, you may or may not be able to see them, but they’re there! Brown ground beef. Drain excess grease. Add in taco seasoning and water (following directions on back of seasoning packet). 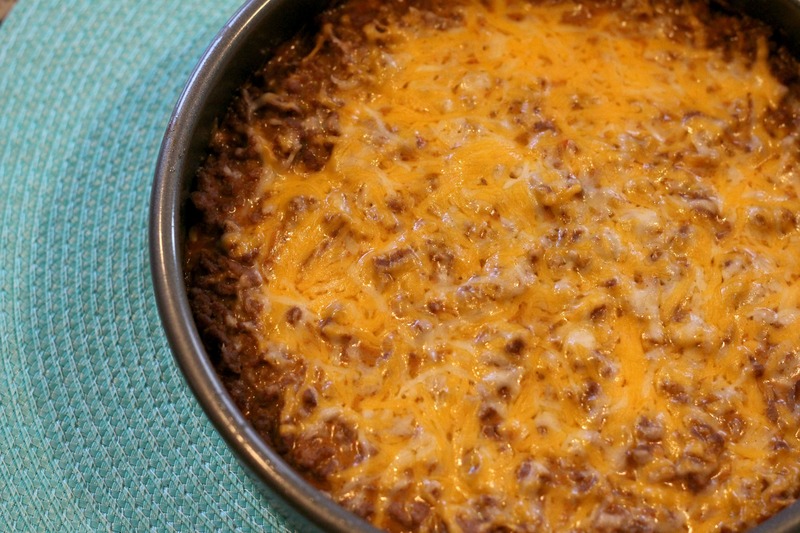 Once the taco meat is ready, turn off heat and stir in 1/2 cup salsa con queso. Preheat oven to 350F degrees. Spray an 8-inch round springform pan with nonstick cooking spray (If you don't have a springform pan, a regular 8 inch round cake pan would work). Layer the bottom of the pan with a flour tortilla. Add about 1/3 of the ground beef taco filling on the the first layer. Then add 1/3 of the shredded cheese. Continue until you are done with all the layers: another tortilla, more taco mixture, more cheese. Bake for about 15-20 minutes, or until cheese is melted and edges are slightly golden brown. Allow to cool for a couple of minutes. Then slice and serve with optional toppings. Never too much beef and cheese!!! Thanks for stopping by and for liking my post. 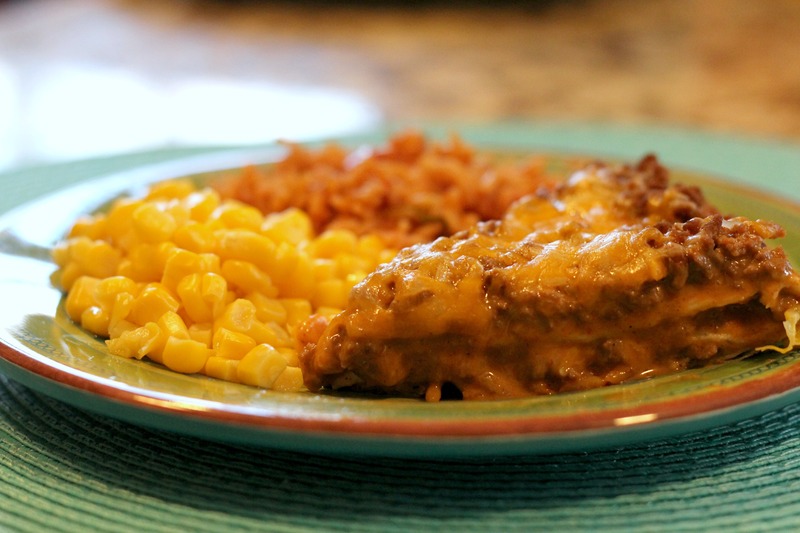 This looks delicious, I love cheese and I’m a carnivore…so I would love to eat this.. and I love corn too! Have a great week! Thanks Liz! This is definitely a carnivore’s delight! Hope you have a great week too! You could never post too many mexican recipes! This looks absolutely yummy. Well I’m glad you feel that way, ‘cuz we make a lot of Mexican around here! There is no such thing as too much Mexican food!! Keep ’em coming – we love it! YUM!! 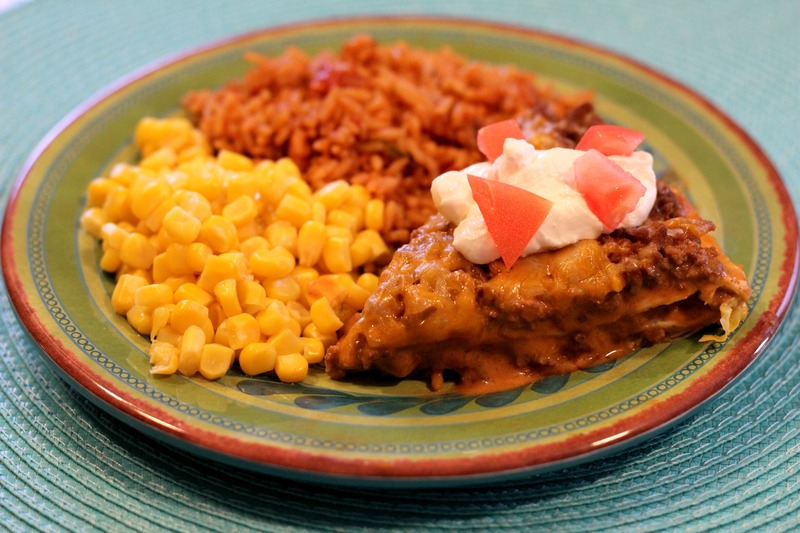 Being from Texas, we are totally crazy for Mexican food and can eat it several times a week without tiring of it You are right, most mexican food are the same ingredients, just put together differently, but we love them anyway… Thanks for a unique take on the usual mexican recipe. I recently spent a week in Dallas, and enjoyed some AMAZING Tex-Mex! You Texans know how to make some good food! Never too much Mexican food. Sounds like a dish I used to make in college, but forgot about along the way. You got me craving this right now and its 6:30 in the morning. Love the blog. Hey there’s never a wrong time for Mexican food! I made this tonight for dinner, and it was so good and easy. I suspect this is going to be my new go-to recipe site! Thanks Heidi! So glad you liked it! I hope you find many more recipes to try! Do you cover when baking? Hi Donna. You don’t need to cover when baking. I made this for the first time a couple of years ago and it was a huge hit. My husband loves it with diced tomatoes, however I use a nice hot sauce, Swamp Scum, on mine and it’s awesome!! Definitely a family favorite! Just used this recipe. The middle layer I put in some refried beans. The meals was said to have been delicious. Glad you liked it, Nick!